Lasette & Murphy were Frank B. Lasette (1869-1950) and Jeremiah L. Murphy (1867?-1951). They were partners in a plumbing business from 1900 to 1922, and were located at 2267 Broadway from 1900 to 1907. This particular piece of sidewalk furniture, then, was at least one hundred years old in 2008. In March, 1921, the New York Times, 24 March 1921, p. 33, reported that both Lasette and Murphy had been found guilty of violation of anti-trust laws. The headline read, "PLUMBERS AT WORK IN JAIL. Seven Serving Anti-Trust Terms Sweep Office and Help Bake Bread." The article read, "Seven of the eight plumbers sentenced to jail by Justice McAvoy on Tuesday were at work in the City Prison yesterday, according to Warden John Hanley. Some were sweeping the office and lobby and others were assisting in the bakery. The term of Frank B. Lasette, business partner of Jeremiah L. Murphy, will not begin until Murphy's term has expired. Lasette and four others were sentenced to thirty days each and two plumbers were sentenced to ten days each." Shortly after their jail terms the partners seem to have gone their separate ways. In the 1920s J. L. Murphy Inc. was located at 238 W. 108th St., and later at 340 E. 44th St. Frank B. Lasette Inc. was located in Long Island City (at 41-32 27th St. from 1931 to 1950). This notice appeared in the New York Times in August, 1929, as part of a full-page ad announcing the opening of the Hotel Governor Clinton. Frank Lasette Inc. had installed the building's plumbing. This standpipe on W. 31st St. bears witness to Lasette's work at the hotel. Some of the history of the Hotel Governor Clinton can be found on 14to42.net. Another New York landmark with Frank B. Lasette plumbing is the Beresford Apartments (Emery Roth, 1929) on Central Park West between 81st and 82nd Streets. This drain cover on W. 82nd St. carries the Lasette name. When Jeremiah Murphy died in 1951, he received an extensive obituary in the New York Times (14 July 1951, p. 13) reading in part, "Jeremiah L. Murphy of 44 East Sixty-seventh Street, president and founder of J. L. Murphy, Inc., plumbing and heating contractors, died yesterday at the New York Hospital after a brief illness. His age was 84. A native or Ireland, Mr. Murphy came to the United States in 1881. 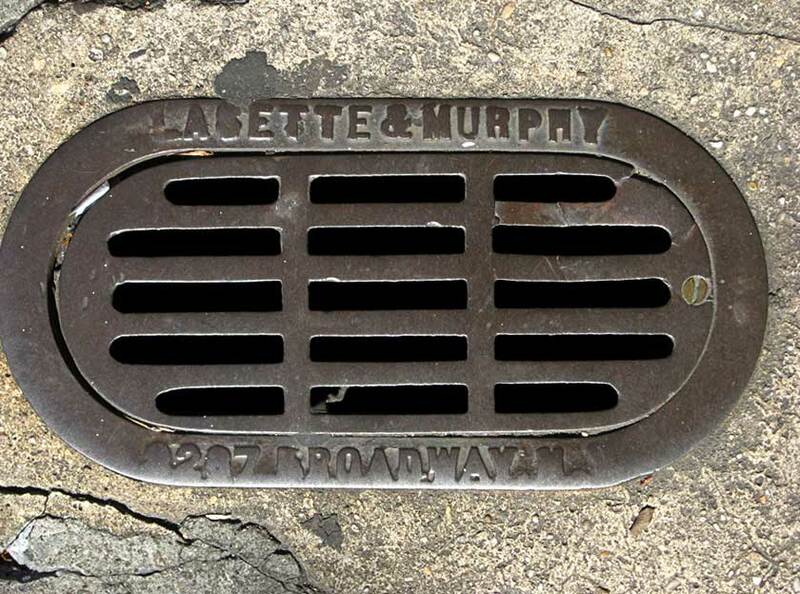 He worked as a plumber for nineteen years until he became a partner in the firm of Lasette & Murphy in 1900. He started his own company in 1921. ... His company was responsible for installation work in many of the city's largest buildings, including the Empire State and Radio City Music Hall. It was also the contractor for the installation of plumbing in all of the multi-family housing projects built by the Metropolitan Life Insurance Company, New York Life Insurance Company and Equitable Life Company. Among these projects were Parkchester, Stuyvesant Town, Peter Cooper and Manhattan Apartments in New York, Park Merced and Park Labrea in Los Angeles and Park Fairfax in Arlington, Va."
Frank Lasette also received an obituary in the New York Times (21 Dec. 1950, p. 29) reading in part, "Frank B. Lasette, president of Frank B. Lasette, Inc., 41-32 Twenty-seventh Street, Long Island City, Queens, plumbing contractors, died of a heart attack yesterday at his home in the Surrey Hotel, 22 East Seventy-sixth Street. His age was 82. Born here, Mr. Lasette began in the field in 1885 as an apprentice plumber with the firm of J. N. Knight & Son at 710 Seventh Avenue. Later, as a craft manager for the Knight firm, he worked on the plumbing installations at the Metropolitan Life Insurance Company buildings, the New Netherland Hotel, the Home Life Insurance Company and the Majestic Hotel. He went into business for himself in 1898 and two years later formed the partnership of Lasette & Murphy, Inc., with Jeremiah L. Murphy. This firm was dissolved in 1926. Since 1926 Mr. Lasette had headed the firm bearing his name. He was president of 22 East Seventy-sixth Street, Inc., which owns the Surrey Hotel, and had served as a member of the Bank of the Manhattan branch in Long Island City." Among Lasette's survivors was a sister, Mrs. Jeremiah L. Murphy. This building drain cover on W. 93rd St. bears the name Frank B. Lasette. This one on W. 79th St. has J. L. Murphy.